Some time ago, I wrote a post called, “What If I Mess Up? Why Going Vegan is Not a Pledge of Perfection.” The idea was to emphasize that moving toward a vegan lifestyle isn’t a test of personal fortitude–it’s about the sincere intention to do something good for animals, for our planet, and for your body. Getting overly worked up about being a “perfect” vegan can actually obscure that intention, not to mention rob the lifestyle of its pleasure. I still receive a lot of comments on that post, and one recently stood out to me because I think it captures some of the pressures associated with going vegan. 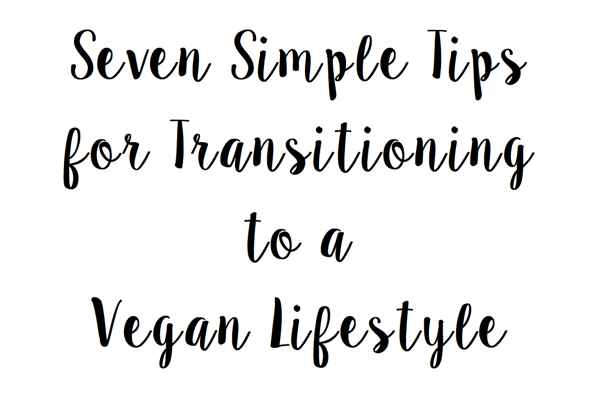 I’d love to chat about these pressures and offer a gentle counterpoint in the form of seven simple tips for transitioning to a vegan lifestyle. There seems no better day to do it than January 1, a day that is associated with new beginnings. She also noted that it’s really hard to sort through the ins and outs of veganism because there are so many different, popular approaches being shared on social media these days, including raw foods or raw till 4, 80/10/10, and more. What’s the best way to be vegan? These are all such natural questions. It’s tough to figure out how to eat these days because there’s so much food noise out there. You’d think that going vegan might help to clarify things, but the plant-based world is subject to its own conflicting perspectives. While I can’t make broad claims about the “best” approach to veganism–that’s a question that has to be answered by individual experience–I can offer these seven tips about the experience of becoming vegan (or becoming more vegan) that have been helpful to me, to my clients, and to other vegans I know. 1. Transition at a pace that works for you. Some people go vegan overnight, and they never look back. That’s wonderful and exciting, but it’s only one type of experience. For many other folks, a gradual transition feels more harmonious and realistic. I am one of these people: I gave up red meat first, moved away from poultry and fish to vegetarianism many years later, and became vegan only after hesitantly eliminating dairy and then eggs. It took a long time, but the gradual nature of my choices allowed me to feel confident and at peace with the process, and it also prevented me from grappling with too many cravings or strong emotional attachments to animal foods. For some people, the choice to go vegan is prompted by a health crisis, and so the need for change is urgent. I was motivated to go vegan by chronic health issues, but I had the luxury of time. How quickly or slowly you transition is a choice you should make based on your goals and circumstances. No matter where you’re coming from or what motivates you, rest assured that a few steps toward vegan living are likely to have a profound and important impact on your health, the environment, and animals. 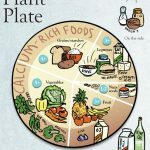 If you simply commit to one vegan meal each day, a few meatless dinners each week (or a new Meatless Monday tradition in your home), or a gradual elimination of one animal product at a time, you’ll start reaping the health benefits of emphasizing more plant foods in your diet (more fiber, more healthful phytonutrients, less saturated fat). You’ll reduce your carbon footprint, and you’ll contribute to less animal suffering. Rather than focusing exclusively on the end goal of veganism, also consider the impact and meaning of each new choice you make. Celebrate those choices, and allow them to start adding up. 2. Do a little homework. I’m all about the idea that veganism can feel simple, intuitive, and fit seamlessly into all sorts of lifestyles. 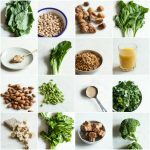 But the truth is that any significant dietary change can present us with questions and concerns about getting the right nutrients, and veganism is no exception. Before you make the transition, spend some time reading up about vegan nutrition. This doesn’t mean seeking out a bunch of dense textbooks or papers (though if the nutrition nerd in you is so inclined, go for it!). It can be as simple as turning to one really great, comprehensive resource. My favorites for new vegans are the express edition of Becoming Vegan by Vesanto Melina and Brenda Davis, and Vegan for Life by Ginny Messina and Jack Norris. Both are readable, succinct primers in plant-based nutrition, and they offer broad, evidence-based perspectives. Taking the time to read up on vegan nutrition will give you confidence in your choices, and it’ll also help you to knowledgeably address any concerns or questions that are raised by friends, family, or acquaintances. 3. Find your way toward a diet that’s sustainable and balanced. Just as there are many debates about the “perfect” human diet, there are lots of debates about the best way to eat vegan. You may not know what’s best for you until you’ve experimented with veganism for a little while, paying close attention to how you feel. When you first make the switch, though, it’s a wise idea to avoid any drastic or difficult approaches to plant-based eating. If something sounds unsustainable to you, if it appeals to any part of you that’s drawn to extremes, or if your deep-seated intuition tells you that it’s not healthy or balanced, then it’s probably wise to step aside and let common sense guide you. Stick to a diet that gives you plenty of variety and abundance, as well as a good balance of macronutrients. If you ask me, the best diet for each of us is one that encourages good health, satisfies hunger, and gives us pleasure–a diet that’s nourishing for both body and spirit. Allow your own judgment, wisdom, and experience to take you there. 4. Find community & support. Change can feel lonely sometimes, and evidence suggests that a lot of vegans and vegetarians give up the lifestyle because they feel that it makes them stand out too much, or feel too different. Having the support of others can go a long way in helping to ease and enrich your transition to a new lifestyle. If you have family members or friends who are interested in your new way of eating, try to enlist their support and company. They may not want to explore veganism with you, but they may want to come over to cook a vegan meal with you, or serve as grateful recipe testers when you try a new meal. I’ve always believed that the best way to advocate a vegan lifestyle is through great food, and I definitely encourage you to share your recipes with others. If you don’t have support at home, try branching out into your community, exploring vegan potlucks, restaurants or eateries, or meetup groups. You can also find community online, by reading and commenting on blogs, joining forums, exploring great plant-based websites (like ChooseVeg) and sharing your recipes on sites like VegWeb. The most pleasurable part of my own journey to veganism was having my culinary horizons dramatically and permanently expanded. Before I went vegan, I had never tried tempeh, soba noodles, kimchee, kabocha squash, nutritional yeast, millet, mulberries, or buckwheat…and that list goes on and on. Going vegan encouraged me to explore new flavors, new cuisines, and new ingredients. I grew up eating a very unadventurous diet, and my palate was further depleted by my ED history. Rather than narrowing my diet, veganism has encouraged me to take chances. Many diets and culinary traditions around the world are already plant-based. Take the transition to veganism as an opportunity to explore the rich offering of plant-based global cuisine, to taste new herbs and spices, and to step outside of your comfort zone. 6. …but respect your traditions. Food is fuel, but it’s also a form of tradition, family storytelling, and celebration. It’s a profound form of pleasure, too, and research suggests that pleasure and taste contribute to overall patterns of balance and healthy eating. Whether you’re exploring veganism gradually or going vegan overnight, remember that this process doesn’t mean giving up all of your favorite foods and dishes. It simply means finding new and creative approaches to preparing them. Give some thought to plant ingredients that can creatively evoke some of the textures and tastes of your favorite omni recipes: some of my favorite examples include lentil bolognese, almond milk coffee creamer, whole roasted lemon tahini cauliflower (in place of an animal protein centerpiece), quinoa chickpea burgers, and classic tofu scramble. It’s also worth saying that meat and dairy replacements can be really helpful in evoking tradition, too. Faux meats get a bad rap sometimes, but they can bring wonderful authenticity to a strictly plant-based diet–and a lot of them are perfectly healthful and consciously produced. If you prefer to cook with mostly whole foods ingredients, that’s cool, but don’t hesitate to explore the products that vegans have at their disposal nowadays. Some of my favorites include Beyond Meat grilled strips, Chao or Daiya cheese, Nancy’s Soy Yogurt, and Neat Meat mixes. 7. Keep the big picture in mind. People explore veganism for many different reasons, so I can’t generalize about what veganism is for each of us. I think I know what it isn’t, though: veganism isn’t a race. It isn’t a contest. It’s not about measuring up to something you saw on Instagram, and it’s not about adhering to rules. If at any point it starts to feel this way, or if start to feel trapped or constained, take a deep breath, turn inward, and keep the big picture in mind. No matter how varied and personal the factors that draw us to veganism are, I do think that most vegans share a common interest in creating a more conscientious lifestyle, whether through nourishing food choices and enhanced self-care, a more compassionate approach to eating, or the desire to tread more lightly on mother earth. Here’s the thing: you don’t have to be “perfect” to become more conscientious. If you have the desire and intention to live compassionately (and I meant “compassion” broadly–compassion to animals, compassion to the planet, compassion to other human animals, and compassion to yourself), then you are already doing so much of what veganism asks of us. I’m not saying that intentions matter and actions don’t–our actions and lifestyle practices are tremendously important, of course. But at the end of the day, I think that veganism begins with an intention to live a certain way, to leave a certain kind of impact on the world, and that intention isn’t defined by whether or not it all comes easily to you right away. You can return to that intention again and again, whenever the day-to-day minutiae of changing your lifestyle or navigating a new diet or fending off criticism feel overwhelming. And if you have moments of struggle with non-vegan foods, that’s also a good time to tap into the intention, reminding yourself of what made you admire and seek out veganism in the first place. After how long without animal products can I consider myself vegan? I didn’t tell anyone I had gone vegan until quite a few months, maybe even half a year, after I’d stopped eating animal products. I was afraid I might have a change of heart and regret using the label; I was afraid of how I’d be perceived; I was afraid I’d be accused of an ED relapse; I was afraid that I would stay attached to my wool sweaters and leather shoes forever and thus never qualify as a “real” vegan. In retrospect, this was all totally understandable, but I was worrying too much. I really enjoyed my vegan transition, and I could have spoken honestly about it sooner without getting stuck on the minutiae. 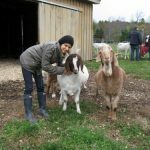 I think the moment I really knew that I’d remain vegan forever was my first visit to Woodstock Farm Animal Sanctuary, where I connected to veganism in a totally new way. Soon after that, veganism no longer really felt like an active choice I was making; it felt like a part of who I was. Animal products stopped feeling like options I was choosing against, and started to feel not like food at all. That was my moment. Each person, I’m sure, has his or her own, and it’s also worth saying that the road can take all sorts of twists and turns and unexpected detours. But as far as becoming vegan goes, I’m not sure it’s something you measure in days or meals; I think it’s a sense of conviction that emerges over time. And I think it’s probably the case that the pressures and deadlines we attach to change can actually get in the way of that process. So, I hope that these tips will help to make it all feel just a little more intuitive. And I wish the many folks who will dip their toes into the vegan waters this year–or perhaps plunge in right away–a fun, curious, fulfilling experience that is animated by deep compassion and feeling. On that note, it’s time to wish you all a happy, happy start to 2016. See you on Sunday for weekend reading! Congrats on going fully vegan, Gen! I know, I know — the restaurant thing is so lame sometimes, but over time, I’ve come to feel that the little inconveniences and restaurant frictions are so outweighed by everything else. Loved this post Gena. Very inspiring. Happy New Year! Thanks, Ali. Happy new year to you! Nice writeup. I can relate to so much of what you said! Transitioning to vegan after being a vegetarian for 30 years is the best thing I’ve ever done. For any vegans in hiding out there worried about “relapse” – just get on a bunch of vegan Facebook pages, watch all the vegan documentaries like Cowspiracy, etc, and you’ll never look back. LOVE PEACE and JOY to all you vegans out there! I was also highly motivated to transition to a vegan diet (from vegetarian) for health reasons. I miss cheese, but I feel so much better now that it’s gone. The energy, mental clarity, more steady emotions, lack of bloat, etc. is so awesome! Thanks for the kind, encouraging post! I am so thankful to you .A big thanks for the article .It is really interesting to read and gain knowledge .Thank you for sharing the article with us . What a wonderful post! I really needed to hear this right now. I feel like so many of the things you just said apply to so many other things in life as well, like thinking of recovery as a process and not a perfect finish line. I really love your blog, you have so much thoughtful content and I really feel like you understand. 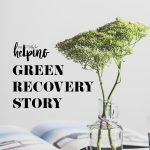 So glad that this is a helpful post, Katina — and also that you seem some echoes for the ED recovery process. I’m glad that you do.